Superior Space Utilization: Deep-lane, flow-through storage optimizes the space utilization of palletized, slip sheet and pallet-less unit loads. Loads are stored in a first in/first out configuration. Dynamic Movement: Movement through the storage system is pneumatically-controlled. Unit loads rest on static rails. Air forced into tubes raises sections of wheel or roller conveyors that make contact with the load. The speed of the movement and the distance traveled is controlled by intermittently raising or lowering the hose at timed intervals controls. Gravity does the rest. Safety: With its unique lock out/tag out feature, this product is the only high-density storage solution that is OSHA compliant for confined spaces. Integration with Automation: The precise, controlled movement of unit loads automated storage and retrieval cranes and robotics for improved throughput and productivity. 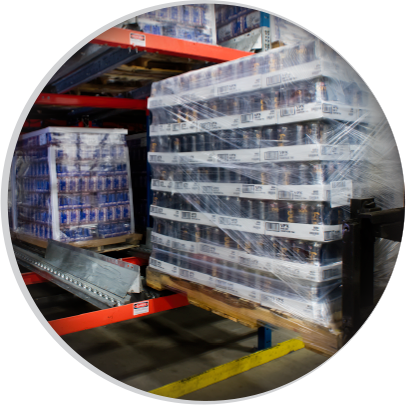 HDX Storage Solutions have been adopted by the food, beverage, electronics, fast-moving consumer goods and automotive industries. This product is ideal for freezer and refrigerated applications.